New to The Ninth Configuration and Blatty's work? Start HERE. Note: This website is best viewed in Mozilla Firefox. Latest news! » "Ghosts In The Cockpit" | "LEGION - DIRECTOR'S CUT!" | "Some Book Updates" | "LEGION Blu-ray Specs!" | "Rest In Peace, Bill"
The Exorcist for the 21st Century should ship with the Stephen King book in December." "CD #62 through #66 of the magazine are all going to press at the same time in September, so they can ship by the end of the year. Lots of great Blatty material on the way!" :: LEGION - DIRECTOR'S CUT! Finally, after all these years, it's really happening! Release date is October 25th, and additional special features will be announced at a later date. I guess the lost footage wasn't "lost" or "destroyed" after all, thank God! If I hear anything else, it will be posted here. You’ve heard the rumors for months... and they’re all true! William Peter Blatty’s cult favorite THE EXORCIST III will be bearing its cross on a 2-disc Collector’s Edition Blu-ray set from us on October 25th. Extras (of which there are tons of) are underway and will be announced at a date in Late Summer / Early Fall. The newly-designed front-facing artwork from Joel Robinson you see here is final (not pictured is the reverse wrap image which will showcase the original theatrical poster art.) Early pre-order now directly from us @ https://www.shoutfactory.com/film/film-horror/the-exorcist-iii-collector-s-edition and receive a free 18" x 24" poster of the new art (while supplies last) plus early shipping! We know that the biggest question you might have is: Will there be a “Director’s Cut” of the film? The answer is yes—but with some caveats. We are working on putting together a version that will be close to Blatty’s original script using a mixture of various film and video tape sources that we have been provided with. This is still a work in progress and we will update you with more details at the time we announce the full list of bonus materials. While I still have access to a sufficient number of neurons, I would like to use your site to correct a misapprehension that I see still turning up here and there, including on Amazon'sExorcist site, namely that I consider The Ninth Configuration to be the sequel to The Exorcist Did I ever say that? Who knows: I'm almost 84 years old. But I think this misapprehension might well be traceable to Mark Kermode, who long ago named The Exorcist, The Ninth Configuration and Legion "The Trilogy of Faith." Or not. But today the three of my works I would link together are The Exorcist, Legion and Dimiter. The Exorcist argues for God's existence in a very general way while Legion approaches it in a very specific, evidential way that to a great extent involves intelligent design. In Legion there is a dream sequence in which the Humphrey Bogart of Casablanca criticizes Lt. Kinderman for leaving Christ out of the equation, to which Kinderman replies that he intends to include him. Dimiter is the fulfillment of Kinderman's promise. To quote from A Man For All Seasons, "I trust I make myself obscure." From William Peter Blatty, renowned author of The Exorcist, comes one of the most unique and extraordinary films on screen, The Ninth Configuration, a taut theological thriller from 1980, which makes its UK Blu-ray debut courtesy of Second Sight. This mind-blowing cult classic arrives on Blu-ray and DVD, as well as download and On Demand, on 25 April 2016, complete with a whole host of newly produced bonus features, including brand new interviews with William Peter Blatty, Stacy Keach, and many more. Deep in a forest of pine trees near the coast of Washington State, stands a secluded Gothic castle, commandeered by the Pentagon for use as a military asylum. Determined to establish the true nature and origin of the men’s mental illness, the Pentagon enlists the services of Colonel Kane (Stacy Keach, American History X), a brilliant, yet strangely unorthodox psychiatrist. With a reserved calm, he indulges the inmates’ delusions, allowing them free rein to express their fantasies. But some are wary of the newcomer and his methods. There may be more to Kane than meets the eye, and the insanity escalates towards an explosive revelation. Written, directed, and produced by William Peter Blatty, this tense and gripping tale mixes theology and psychology and hosts a stellar cast including Scott Wilson (The Last Samurai), Jason Miller (The Exorcist), Ed Flanders (The Exorcist III), and Tom Atkins (Lethal Weapon). Who is Kane? And what has is he hiding? Some news. TNC star Robert Loggia recently passed away. Rest in peace, Robert. I also neglected to mention, several years ago, that Richard Lynch also passed. A belated RIP. Me: Morgan Creek have been posting some rather cryptic things on their Twitter account with regards to a DVD special release. Can you shed any light on what they may be talking about? Regarding HOW the missing footage was found, Bill has said that "it’s not clear as yet." MARCH 31 UPDATE from Bill Blatty: "SONY has picked up the TV rights to THE EXORCIST mini-series. At the moment, that's all I know." Also, a very happy early birthday to Bill who turns 87 on January 7! Further to the update on November 12, Bill has provided me with the "almost final" cover for the March 30 release of Finding Peter: A Wild Ride In Search Of The Soul. It is appears that The Ninth Configuration on Blu-ray has been delayed, though some lucky fans have received theirs in advance. According to Billy, the distributor ran out of stock and have yet to be re-supplied. December 2 looks like our best bet, or thereabouts. Perhaps sooner. It is my pleasure to provide some updated details on the previously reported upcoming work by Bill, then tentatively titled Not A Horror Novel: A Wild Ride In Search Of The Soul. The book will now be titled Finding Peter: A Wild Ride In Search Of The Soul, and will be released on March 30, 2015. 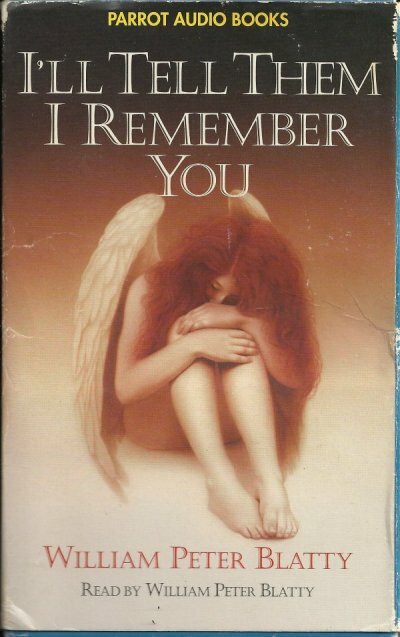 To remind you, Bill described it as "part funny memoir and part proof of life after death". "For those who have lost a loved one to that liar and fraud named Death. So reads the dedication of William Peter Blatty's "Finding Peter," a deeply moving memoir that tests the bounds of grief, love, and the soul. Blatty, the bestselling author and Oscar Award-winning screenwriter of "The Exorcist," lived a charmed life among the elite stars of Hollywood. His son Peter, born over a decade after "The Exorcist," grew from an apple-cheeked boy into an "imposing young man with a quick, warm smile." But when Peter died very suddenly from a rare disorder, Blatty's world turned upside down. As he and his wife struggled through their unrelenting grief, a series of strange and supernatural events began occurring--and Blatty became convinced that Peter was sending messages from the afterlife. A true and unabashedly personal story, "Finding Peter" will shake the most cynical of readers--and it will remind those in grief that our loved ones do truly live on." The Ninth Configuration on Blu-ray is now available, though temporarily out of stock at amazon.com. However, it is widely available on eBay. Grab yours now! The cover for the Blu-ray release of The Ninth Configuration has been unveiled! Hi, Ryan! Don't have a release date yet but attached is the cover for the 9th Blu Ray. I must say I like it. Ryan, a Blu Ray of The Ninth Configuration will be released in October. :: Smoke & Mirrors Finally Arrives! After a LONG wait, it has finally been released! :: Plethora Of News For 2014! Note: Smoke And Mirrors has long been in production, featuring Bill's teleplay "Hell Hospital" and a treatment called "Faith". With a baby on the way in August, updates here have been lacking, though the following should more than make up for it. "I've finished a new non-fiction book that's part funny memoir and part proof of life after death. It's called NOT A HORROR NOVEL, A Wild Ride in Search of the Soul. Also, The Ninth Configuration is presently being converted to Blu-ray. Cemetery Dance is planning publication of six of my screenplays [note: listed in a previous update], including my first draft of ONE FLEW OVER THE CUCKOO'S NEST. We're casting THE EXORCIST play in hopes of a Broadway run. Next week I MIGHT have some word on THE EXORCIST mini-series. I'll tune you in." Lots happening this year. Stay tuned! "Regarding Legion, Warner Brothers is doing an all-Exorcist package which will include a Blu-ray, though without any features. As for my Julie Kinderman work-in-progress, I've competed about 80 pages that I'm quite happy with and have a single-spaces 35 page treatment to work with but have found it difficult to go back to it inasmuch as it is a pure "entertainment" and I feel I'd rather be remembered for Dimiter, Crazy, and Not A Horror Novel as my farewell works rather than an excursion into the horror pits. We shall see. how the Muse moves me." Also, the forums are a little bit deserted, if you would like to join in on (or initiate!) some discussion. :: Lots Of Book News! I've posted the current production updates from Lonely Road Books on the website's News Page. Recent updates include photos of the Deluxe Lettered Edition of The Exorcist: The 40th Anniversary Revised Limited Edition by William Peter Blatty. Five Separate Limited Edition Volumes Housed In One Beautiful Slipcase! A Signed Collectible Set With A Print Run Determined By The Collectors! This is an incredible project by Lonely Road Books that we think will have collectors talking for years to come because we've never seen anything quite like it before! William Peter Blatty, the legendary author of The Exorcist, Legion, and many others, has opened his personal library to share five screenplays he wrote at different stages of his career including a first draft of Viva Las Vegas (yes, the Elvis movie! ), a version of One Flew Over the Cuckoo's Nest meant to star Kirk Douglas, a screenplay based on an unfinished novella by Truman Capote, another constructed around the idea of a "behind the scenes" look at the making of a film very much like The Exorcist, and the story of a Japanese detective set in Tokyo. Each screenplay will be bound as its own collectible Limited Edition volume and those five volumes will then be housed in a hand-made slipcase. Each screenplay is an exact reproduction of the writer's work, down to any imperfections in the typewriter he was using at the time. You'll never be closer to these films-that-could-have-been than when you're reading these screenplays. The versions you will hold in your hands have never been read outside the offices of Hollywood production companies and William Peter Blatty's personal library, so this is a rare glimpse into an alternate film universe that could have been very different from the one we know. There are no plans for these screenplays to ever be reprinted. When you consider the number of volumes in this set, you're only paying $35 per bound book and these beautiful hardcovers will be housed in a handsome hand-made slipcase to protect your investment for years to come. We're also offering Free US Shipping via Media Mail for ONE WEEK ONLY, so don't wait to order if you'd like to take advantage of those savings! To make this project extremely collectible, Lonely Road Books will only be printing enough copies of this beautiful Limited Edition set to fill the orders placed between October 1 and October 25. If 200 copies are sold, that's all that will be printed, so this could become one of the most collectible special editions ever published by Lonely Road Books. There will only be 52 copies of the Lettered Edition produced and those are being sold on a First Come, First Served basis. Viva Las Vegas. How naïve could I be? My comedic premise was that Elvis was hired as a Vegas casino lounge act because the booker was certain he was so loud and annoying he would drive the gamblers out of the lounge and to the tables. The "Colonel" was not amused. One Flew Over the Cuckoo's Nest was written in 1968 for Kirk Douglas who was to play McMurphy. I met with Ken Kesey and crafted the script to be as faithful to the novel as I could possibly make it, which was not the case with the film made years later with Jack Nicholson. That this script with Kirk in the lead wasn't made is perhaps the biggest heartbreak of my literary career. Mastermind was a spec script with the lead character emulating my Inspector Clouseau from A Shot in the Dark, the second film in The Pink Panther series. The key to the fun with Clouseau was his sensitive sense of dignity, so I created Japanese Inspector of Police Hoku Fat with that same essence in mind. The new head of ABC Films and his assistant met with me in my office at Warner Brothers to tell me — are you sitting down? — that "Inspector Clouseau isn't good enough anymore. You need a serious theme. We suggest Youth versus Age." With rewrite money and a three month stay in Tokyo where the film would be shot on the line, I replied that I "couldn't be a party to the destruction of my material." I was fired. Worse befell ABC Films: the rewritten screenplay to this day can only be seen on Kuwaiti Airways. Handcarved Coffins is based on a vaguely plotted, unfinished novella by Truman Capote with Michael Cimino set to direct. I gave it a plot but Michael wasn't satisfied and my screenplay languishes somewhere in the ether just above Laurel Canyon. Demons Five, Exorcists Nothing is entirely based on my novel of the same name and is built around the making of a film very much like The Exorcist. I think of both the novel and the screenplay as "A Christmas Carol for Hollywood." With an oversized page size and an extremely low print run, these Limited Edition volumes will be printed on a high-quality paper stock and feature a deluxe binding selected from the finest materials available. This stunning special edition set will be a fine addition to any collector's personal library. "EXORCIST cases should be on the way very soon for the lettered editions. "As for Dimiter, I added in a section I had originally omitted because I had already explored it (my answer to The Problem of Evil, namely The Theory of the Angel), but for this special edition I thought it fitting to restore it. It occurs in dialogue by the one-eyed priest in the cell. With Demons, all I did was soften a bit of unnecessary vulgarity, plus a few things that might have hurt the feelings of my former roommate, [name removed for privacy purposes]. Still, it remains a roma e clef with sixty percent of it being factual recollection rather than fiction." The Exorcist: 40th Anniversary Edition Blu-ray release is scheduled for October. Details and cover art here. The four remaining Blatty-related releases on the horizon (that are currently public; there are lots more things to come, including a script version of The Ninth Configuration through Cemetry Dance at some point), include the lettered edition of The Exorcist 40th Anniversary Edition publication, as well as the Smoke & Mirrors anthology, which I previously mentioned includes Bill's teleplay called "Hell Hospital" and the treatment called "Faith". - Limited to 250 copies, each signed by William Peter Blatty. - Striking dustjacket printed on Mohawk Carnival stock. - The complete text of Demons Five, Exorcists Nothing, with the author’s preferred revisions and additions, never before published. - Full cloth cover with front image inset on front board. - Ribbon marker, head and tail bands, three-piece cloth construction. - The complete text of Dimiter, with the author’s preferred revisions and additions, never before published. Firstly, a belated happy birthday to Bill who turned 85 on January 7 -- with a full year of releases ahead of him/us! Update on The Exorcist limited edition! "We have big news on the publication date for this title. 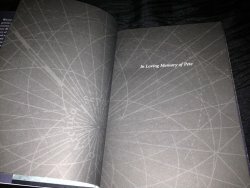 The slipcases for the Limited Edition will be completed by the end of February 2013. Traycases for the Lettered Edition should be ready in the first half of 2013 as well." We should have the traycases in January 2013. Some news from Bill Blatty regarding upcoming releases. Merry Christmas! "A smattering of news: The Exorcist play had a most successful (at least in terms of sellout audiences for six weeks) and will now move to London; Tor/Forge is republishing The Ninth Configuration as a trade paperback and will be offering my entire backlog of work in digital form, which pleases me since I feel that my comic novels are probably my best. Oh, well, at least I actually enjoyed writing them; and next year, to celebrate the 40th anniversary of The Exorcist film Warner Brothers will put out a new high def Blu-ray with lots of new features, including a 40-minutes doc featuring a revisiting the tiny guest house in which I wrote the novel and reminiscing about it, plus some never-before-seen footage of an interview about the 1949 case of possession with Fr. Eugene Gallegher, the Jesuit priest in whose class at Georgetown U. I first heard about it; and, finally, I'm thinking of a plan for a new book for readers who, like you, are searching, and have -- at least for now -- abandoned a terror novel of which I've completed only about 70 pages. It's what they call "an entertainment," whereas the faith book is an apostolic work." Released in 1995 (the book originally published in 1973) and now long out-of-print, and to celebrate the final re-launch of the TNC.com forums, here, as a gift to you, is the audiobook version (in mp3 format, converted from the original cassette tapes) of Bill reading this moving book about his mother and life after death. In an effort to bring Georgetown University back to its former glory (which has sadly dwindled over the years), Bill is currently very busy with The Father King Society. William Peter Blatty’s 1971 novel The Exorcist—which went on to become an Oscar-winning movie—depicts an epic battle of good versus evil waged under the auspices of the Catholic Church. Reportedly based on a real exorcism Blatty heard about as an undergraduate on a scholarship at Georgetown University, the novel is steeped in Catholicism. Indeed, the “hero” of The Exorcist is the fictional Father Damien Karras, a Georgetown Jesuit, who, at great personal cost, drives out the demon. The Exorcist: The 40th Anniversary Revised Limited Edition by William Peter Blatty is being proofread now and we're still right on track for a summer publication date. I'll post more news as I have it, but you can also always email me if you have any questions. Thanks again to everyone for your support of Lonely Road Books. Keep watching your inbox for more exciting news and announcements. The book is designed and being proofread now. We're still right on track for a summer publication date. As I mentioned last time, originally I planned on having 6 color artwork plates in this special edition, but Caniglia went overboard and turned in 13 (!) color pieces, so I'm breaking the budget and adding all of them to the book. In addition, Mr. Blatty has provided an introduction and an afterword that won't be appearing in any other edition, so those have been added to the Lonely Road Books special edition as an unannounced bonus. Finally, there is also a special unannounced bonus for the Lettered Edition customers: because Caniglia turned in so much extra artwork, there will be entirely different artwork on the Lettered Edition's dust jacket. UPDATE: Please see this Facebook Album for images of copy # 100/100! Shipping in late February, the hardcover edition is now up for pre-order. The hardcover edition is limited to just 100 signed and numbered copies, signed by editor Danel Olson as well as authors William Peter Blatty, Thomas Ligotti, Michael Arnzen and Thomas Hibbs. This title will also be available in about three or four weeks. The hardcover edition is signed by editor Danel Olson, William Peter Blatty, Thomas Ligotti, and a few other writers. More information will be coming soon! Caniglia has turned in all of the color interior artwork, and he really went overboard. The original plan was 6 pieces, but there's definitely more than that here. I'm going to break the budget a bit to include ALL of them. Final count will be unveiled in a future update, but I think our collectors will be blown away. The book is being designed now and we're moving along at a good clip. We hope to have design and proofreading completed by April and then the book will be ready for the printer for an early summer publication date. Also, there's a special unannounced bonus for the Lettered Edition customers: because Caniglia turned in so much extra artwork, there will be entirely different artwork on the Lettered Edition's dust jacket. Happy new year! Firstly, a belated happy birthday to Bill Blatty who turned 84 on January 7. 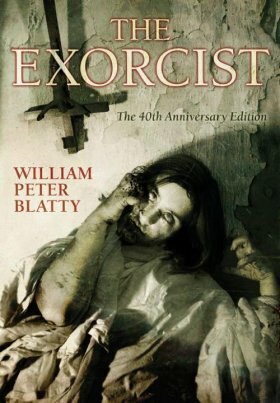 "As I mentioned a while back, Lonely Road Books will be publishing a special Limited Edition of The Exorcist: The 40th Anniversary Revised Edition by William Peter Blatty. The book sold out just 30 hours after it was announced, which is excellent for the collectors who managed to snag a copy, and production is moving along smoothly. In fact, today I'm extremely pleased to unveil Caniglia's incredible cover painting for the book, which I absolutely love. To the fans of Nicol. It's with great sadness, and yet with a heart full of pride and love for a man who was a tremendous father, friend, actor, poet, writer and singer, that I must bring news of Nicol's passing. Dad died peacefully in the early hours of the 16th of December after a two year all out, balls to the wall struggle against esophageal cancer. He gave it all he had: never gave up, never complained, maintained his wicked sense of humor to the end. His last words were "I love you". I was with him, he was not alone, he was not in pain. O, dear God! Too sad! I had great affection for Nicol. And that type of cancer is hideous.